Since getting back from Vancouver, there's been a drought in visits to the beach area by LA's food trucks. We finally got one - and a new one at that (for me anyway) today. I caught a tweet from @LA_FuXion yesterday that would be in El Segundo and one of my tweeps suggested we meet up for lunch. 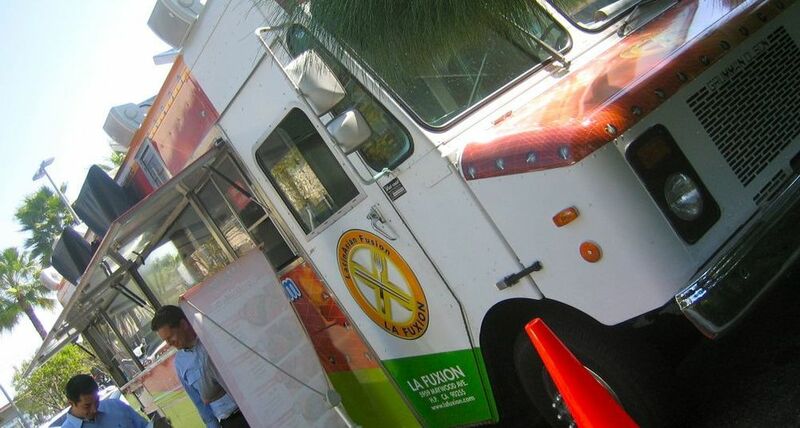 LA FuXion is actually a lot more fusiony than I had expected - clearly taking a cue from the originator of the gourmet food truck, Kogi, most dishes are a combination of Latin and Asian influences. I sampled the Sliced Chicken Kung Pao Szechuan Taco and the Tuna Sashimi Tostada. The chicken was good, but the tuna tostada was really great. Unfortunately, the tostada is the only way they serve the tuna, so I'll have to get the same thing again next time if I want more of that tuna. Regardless, there's a lot of variety on their menu, so I'm looking forward to the next time they're in the area. Its good to be truckin again.